It is one of the most famous works of art by Andrea Pozzo, known above all for its amazing and wonderful effect. Through his painting the artist creates a fake architectural work which gives an optical illusion effect. He was inspired for this masterpiece by the scenes that he had already painted for the Forty Hour Adoration devotion. Pozzo moves the vanishing point of the perspective towards the vault of the nave. This effect captures the visitor as he advances in the church. The large fresco is the main piece of decoration of the church. The paintings exalt the apostolic activity of the Society of Jesus in the world. Pozzo creates an optical illusion that gives the impression of an infinite space. The most famous painting represents the glory of Saint Ignatius of Loyola accompanied by the angels. The trigram of the IHS of Christ, the logo of the Society, on his shield shows the divine recognition of his work. The figure of Saint Francis Xavier guiding the multitude of souls converted in Asia to heaven is also highlighted. 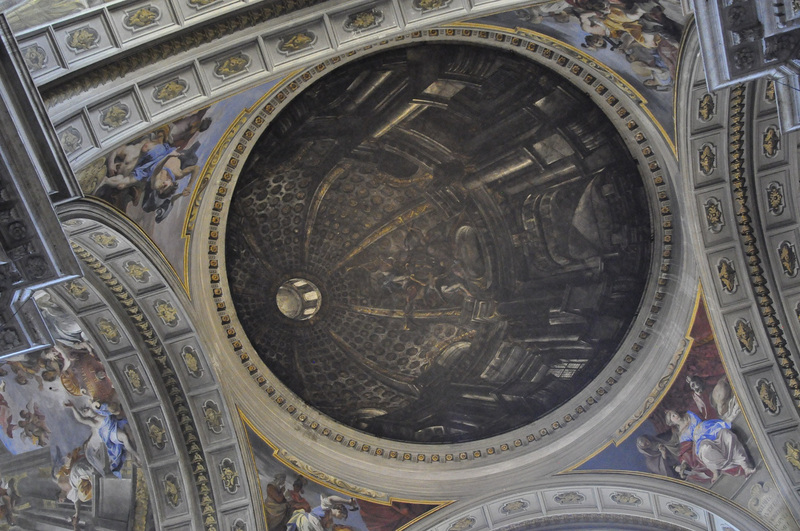 The presbytery and the apse are works by Andrea Pozzo. The scenic effect is amazing: the apse wall seems multilateral while in reality it is a concave wall. Pozzo worked on the frescoes between 1685 and 1701. 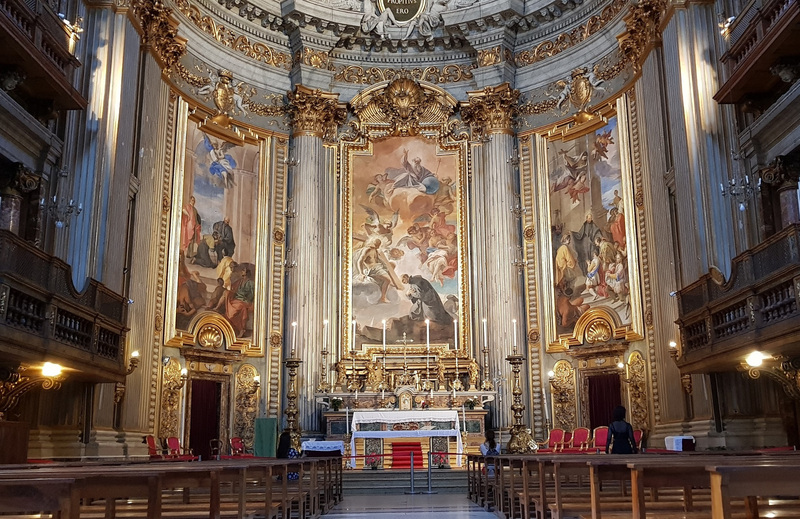 The paintings illustrate the fundamental moments of Saint Ignatius’ vocation and the foundation of the Society of Jesus: the siege of Pamplona, ​​the service given to the plague victims, the entry of Francis Borgia into the Society and the sending of Francis Xavier to the Indies. In particular, the apse depicts the vision of La Storta (Rome). 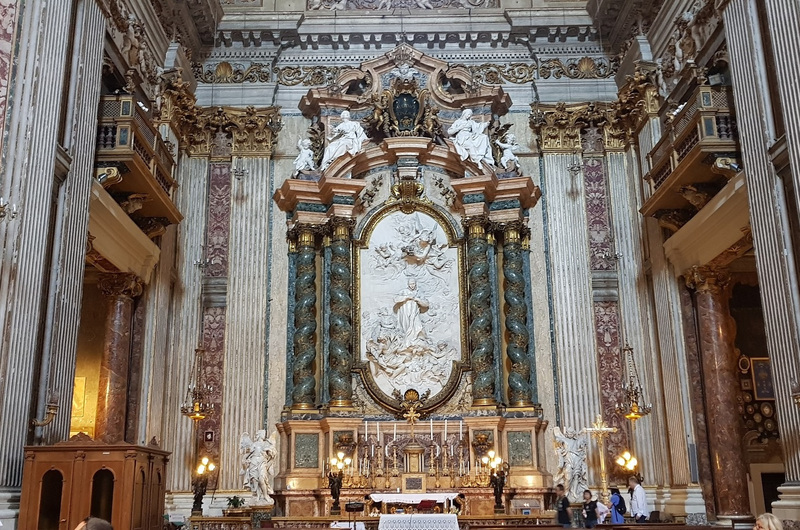 On the right of the transept we find the altar dedicated to Saint Aloysius Gonzaga produced by Andrea Pozzo. The marble altarpiece in the centre represents the ascent of Saint Aloysius to heaven. The symbols of Penance and Purity are above it. The urn in lapis lazuli containing the remains of the saint is situated under the altar. The chapel dedicated to Saint Joachim hosts the body of Saint Robert Bellarmino. The left altar, Ludovisi chapel, is dedicated to the Annunciation and holds the remains of Saint John Berchmans. The altarpiece is by Filippo della Valle.